If it's possible for one amazing appetizer to get the festivities started, then this Game-Day Party Dip is it. 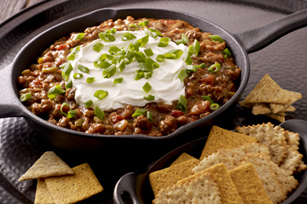 This sausage and bean dip is warm, cheesy and oh-so-good! Brown sausage in large skillet; drain. Return sausage to skillet. Add peppers, yellow onions and garlic; cook and stir 3 min. or until softened. Stir in next 4 ingredients; cook on medium-low heat 5 to 10 min. or until Velveeta is completely melted and dip is heated through, stirring occasionally. Spoon into serving dish. Serve with large thin wheat snack crackers or multi-grain toasted chips. Substitute extra-lean ground turkey for the pork sausage.